Health Benefits of Apples and Homemade Apple Recipes! Discover health benefits of apples for the body, skin and hair! Apples are round shaped fruit grown on small, deciduous, trees. 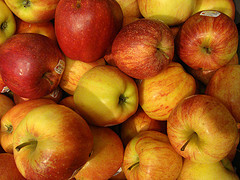 A variety of apples include: Granny Smith, Red Delicious, Golden Delicious, Fuji and more. They come in different colors like red, yellow and green, which vary in flavor and sweetness. They're all good for health but the Red Delicious stand out to be healthier compared to others. Eat clean apples! Some apples are grown with the use of insecticides or protective waxes, containing unhealthy residues. Wash and rinse your apples with soap and water or use fruit and vegetable washes. Consider buying organic apples! CAUTION! Apples can turn rotten. Watch for brown spots or soft texture when squeezed. To avoid becoming sick, do not eat rotten apples. Store whole apples in refrigerator for maximum, extended, nutrient value. Apple juice is an antioxidant drink. Read the nutritional labels on containers. Avoid drinks with a high sugar content. Instead, look for 100% natural fruit juices or make your own, freshly squeezed, homemade juices. Consider buying organic apple juice. Apples contain vitamins A, B, C, E and K as the most prominent. Potassium, calcium, phosphorus and magnesium are the most prominent minerals. Apples contain smaller amounts of other vitamins and minerals too. Apples are low in calories. A medium size apple has about 70 - 100 calories. You should be careful of the amount of fruit you eat each day. The 2010 Dietary Guidelines for Americans, by the USDA, says you should only eat 2 servings of fruit a day, combined with a healthy diet. Apples improve the appearance of skin, especially the Granny Smith and Fuji kinds. Strengthen collagen and elastin in skin, negate visible signs of aging. Reduce fine lines and wrinkles. The skin of Fuji and Red Delicious apples have high amounts of phenols, antioxidant compounds. Phenols provide UV-B protection from the sun and strengthen the skin's ability to resist sun damage. You may not want to peel your apples before eating. Apple skin is healthy, nutritious and packed with antioxidants! -- Homemade Face Mask #1: Mix 1 tablespoon cosmetic clay and 1 tablespoon apple cider vinegar. Blend, removing all lumps. Apply mixture lightly to face. Avoid eyes, ears or other sensitive areas. Leave on to dry for approx. 15 - 20 minutes. Place warm wash cloth over entire face. Gently wipe clean and pat dry. This apple recipe helps get rid of blackheads. -- Homemade Face Mask #2: Mix 2 tablespoons dry oatmeal, 1 1/2 teaspoons cornmeal and 1 tablespoon organic honey, to a pasty texture. Blend pasty mixture with 1/2 organic apple, (cored). Remove mixture from blender. Apply mixture, evenly, over face in circular motions. Avoid eyes, ears or other sensitive areas. Rinse face with warm water. Gently pat dry. This apple recipe exfoliates, moisturizes and softens. -- Homemade Face Mask #3: Mix 1 tablespoon organic applesauce and 1 tablespoon wheat germ to a smooth pasty texture. Apply mixture, evenly, to clean face. Avoid eyes, ears or other sensitive areas. Allow mask to dry for approx. 10 minutes. Rinse face with warm water. Gently pat dry. This apple recipe is a gentle exfoliator for a natural glow. -- Apple Face Care Tip: (Acne, Blemishes or Dark Spots) Gently dab just a bit of organic apple apple cider vinegar on face before sleep. Cleanse face in morning. Repeat until acne fades or dark spots lighten. CAUTION! Discontinue any of the Apple recipes if any discomfort or irritation occurs. Contact your health care provider, if needed. Apple seed extract or fragrance is found in shampoos and conditioners. The Revita manufacturer claims apple seed extract stimulates hair growth with other ingredients. The Tsukuba research team claims Procyanidin B2, (a natural compound in unripe apples), helps stimulate hair growth. Apple cider vinegar helps remove scalp build-up, balances pH of hair, softens, detangles and adds shine! Apple fragrance oil is used for making homemade soap, lotion, shampoo, perfume, body oil and other concoctions.